I was going to post an awesome story about Vermont's adoption of a resolution to impeach Team Bush/Cheney. I was going to theorize that when Bush heard the news, he held a press conference where he announced that Vermont was hiding WMD's and that we were going to go to war with them. Then I realized that laughing about those clowns being impeached was hurting my soul because it was a dream that would never be realized. Like when I think about how I'll never be in the Olympics. So I went in search of something I could write about that would interest you and might be a realistic dream for me. What I came upon was this website where, for the next year or so you can watch a block of British cheddar cheese age, live via the internet. I latched onto this story because A.) Unlike Team Bush/Cheney, this cheese will eventually be eaten alive by the very people who have raised it to its current fame (1 million viewers thus far), and B.) If I can't have TBC booted out of office, I would like to have this cheese named after me. 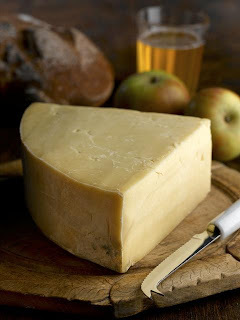 There is a place where you can enter your name suggestion for the famous cheddar. I submitted "LuLu". You should too. I love cheese...a lot...but not so much to watch it age on the net. No way Jose! On the other hand, I am not above voting to name said cheese Lulu. I'll do that once I finish my post. The first part of this post about TBC and the entire last post about that idiot they hired (yeah, I know, that doesn't narrow it down) were so strangely in line with my own thoughts that I have no choice but to determine that either Lulu and I share a brain or she has ESP. You choose.